There is a childlike wonder to trees, the dappled shade that mystifies babies and adults alike seems to appeal to a deeper part of our being. Many across the UK are lucky enough to have access to open woodlands and some to have large trees in their own gardens. These are precious resources that need our protection. 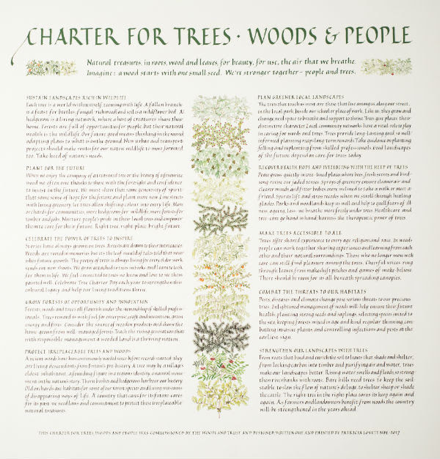 On the 6th November 2017, the 800th anniversary of the 1217 Charter of the Forest, The Woodland Trust launched the new Charter for Trees, Woods and People which sets out, “…10 principles for a society in which people and trees can stand stronger together.” (See the website for more details, or to sign the charter: https://treecharter.uk). The updated charter describes the give and take relationship between trees and people necessary in the 21st Century. Along with the urgent need to protect, sustain and reinvigorate woodland habitats, the benefits of having trees in a human environment are highlighted. We are all well versed in the macro-environmental benefits of trees, but often overlook the positive effects on us and our gardens at a micro level. Even a single tree can reduce the temperature in your garden (by providing shade and through transpiration) and hugely increase biodiversity, thereby having a knock-on impact to the rest of the plants. space is limited, such as on a patio or terrace. They can bring height, fruit, bark and autumn colour into these small spaces.” We couldn’t agree more! The introduction of a tree into your garden can add huge aesthetic as well as environmental value and using a container gives you the flexibility to enjoy these benefits anywhere in the garden, big or small. 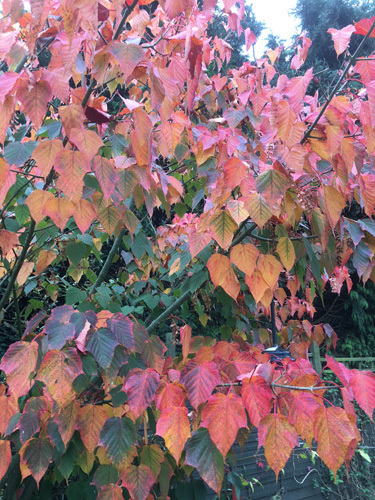 You are not just limited to small fruit trees either, how about trying a Mountain Ash (Rowan) with it’s wonderful autumn berries or one of the many stunningly coloured Acers. Another particular favourite is the Cercis or ‘Judas Tree’, with it’s beautiful heart shaped leaves. To successfully house a tree, you need to choose a container with good drainage and a decent planting depth and width. Metal pots, such as copper cheese vats work very well, as do large stone troughs, especially the squarer ones, providing a natural 360-degree aspect. Have a look at our website for ideas, particularly the “Sinks and Troughs” and “Copper Copper” sections of "Current Stock". Alternatively, give us a call; we are happy to recommend options for your garden. you take the time to listen." With the year’s shows over and most of the antiques delivered to their new homes we have finally had the opportunity to explore a local Worcestershire gem. Described by many as “one of horticulture’s best kept secrets”, Spetchley Park sits within more than four thousand acres of woodland and gardens designed and maintained by a long line of dedicated horticulturalists. Spetchley Park has been in the Berkeley family since 1605; the family also own Gloucestershire’s Berkeley Castle. Since the enclosure of the parklands in 1625, the gardens have constantly evolved. One period of note was the early 19th Century, in the time of Robert Berkeley, whose sister-in-law was the internationally renowned horticulturalist Ellen Willmott. Visiting Spetchley, we were captivated by the spectacular trees which fill large areas of the parkland. The gardens also hold an interesting collection of statuary and antiques including some striking lead figures and a rare Gibbs Heliochronometer sundial. Situated in the Rose Garden, this precision sundial is one of only 1000 made by the Preston firm Pilkington & Gibbs Ltd between 1906 and the outbreak of WWI in 1914. As well as their rarity, these sundials are made particularly special by being the first able to read standard (GMT) time accurately in all seasons. How it has taken the best part of 59 years for me to get to Rome is beyond me! Especially with my passion for stone. We visited for 3 days a couple of weeks ago. The first of many visits now I am sure. The most exciting of all to me so far (3 days worth of seeing so only skimming the surface) has to have been the Colosseum and the Pantheon.. Each built BC with incredible engineering, structure and beauty. The Colosseum may be a ruin now but it allows you to see how it was made all those centuries ago. The materials used and the way they were used so cleverly and successfully is amazing to behold. Roman concrete still very much standing today. – not exposed to sunlight but open through the top of the roof to the elements. Frescos on the walls still keeping their wonderful colour. I believe it has the largest self supporting dome in the world. Made of a composite stone over 2000 years ago. When in the business of buying and selling garden antiques we come across some wonderful old stone items, statues and reproductions of urns and vases which are themselves antique and beautiful. When we visited Rome we not only saw but could be close to, feel and see the quality of the carving of ancient vases, statues and columns. As we wandered through the Roman Forum, the Colosseum, the Pantheon and in the collections of The Vatican. What an absolute privilege it was. How wonderful to still visit a place where you can really experience the beauty and craftsmanship of ancient people close up. Walking through and amongst was very special. So often nowadays somebody somewhere has decided that the original needs to be kept away out of sight and possible danger and it is replaced with a replica. What an incredible loss that is for us all. Not so Rome – simply awe inspiring. We are always happy to welcome visitors to our base in wonderful Worcestershire. Always call before you come please as it is by appointment only to make sure we are there and therefore open.